As we approached November, growers made the comment that this was a season we were ready to put in the books. And then it started raining, and raining and raining. We’ve had a few sunny days since this picture was taken on Nov 19th. 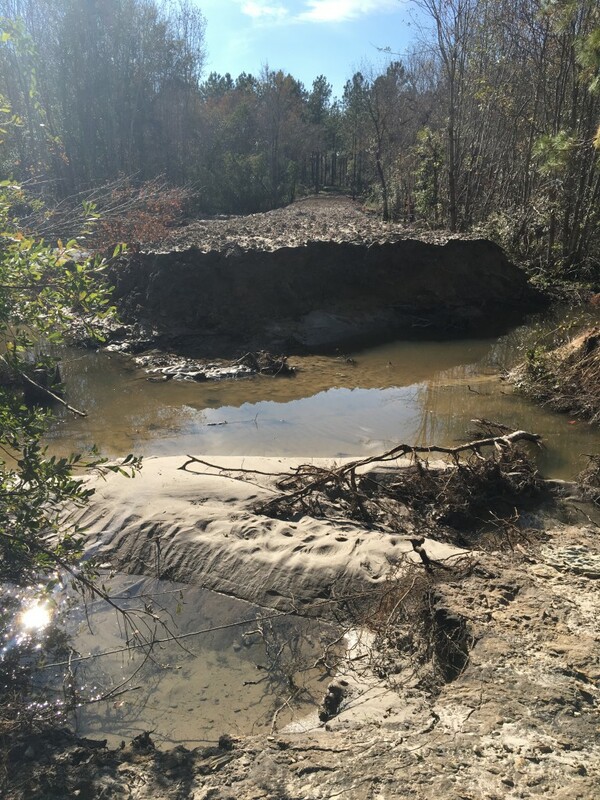 This is what Wilcox County looks like from 2 straight weeks of rain, then more rain over Thanksgiving (and more to come.) The Monday before Thanksgiving may have been the first full sunny day in the previous two weeks. We saw about 8 inches of rain in those weeks, 4 inches came in one night for some. At Thanksgiving, there was essentially no progress made since the first of November. This was one of our first sunny, non-rainy days. Most of our forage was able to be planted in October. This is ideal. 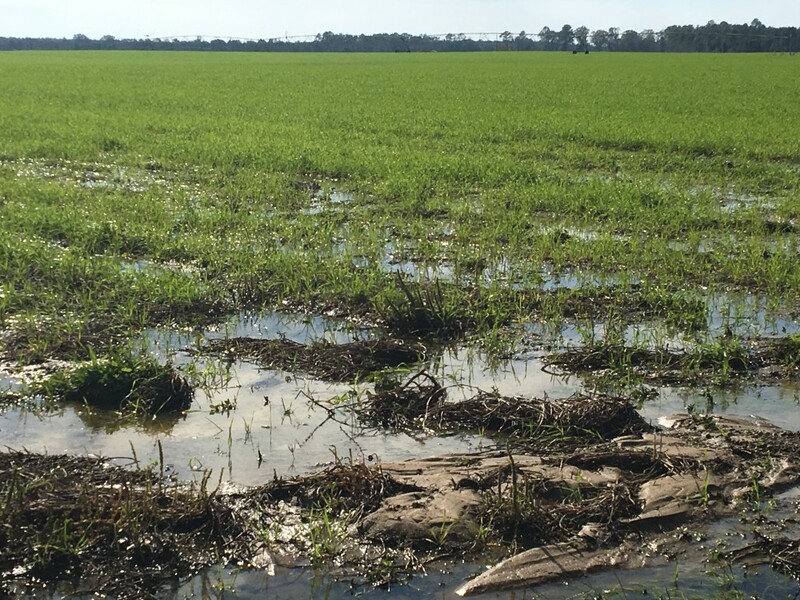 Some planted later would have some trouble with saturated soils. We still got a lot to pick in our cotton crop, and our late planted cotton that did better in the hurricane has now been in a lot of rain. This happened in 2015 as well, and it’ll affect our color grades some. It also stalled all peanut digging and picking. We’re about the same as we were at the first of November. 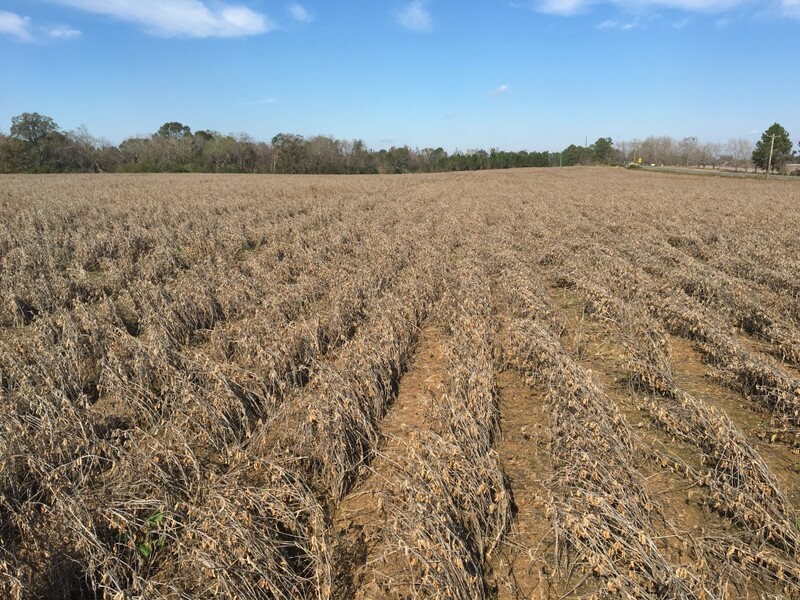 On Monday the 19th, our soybeans were 75% harvested. Here is 70 acres left that has sit through all this rain. You can see where we have some blown over plants. In terms of harvest, this is not a big deal. The main issue here is a pathogen affecting pods called phomopsis pod and stem blight. You get phomopsis and/or anthracnose when we go through rain like this. The pathogens easily spread by wind and splashing rain that move spores through the field. This is going to hurt our quality. We’re seeing yield decline considerably as well. And we were having really good yields before now. The good news so far is that we have not had a load rejected. We are almost done with our soybeans. 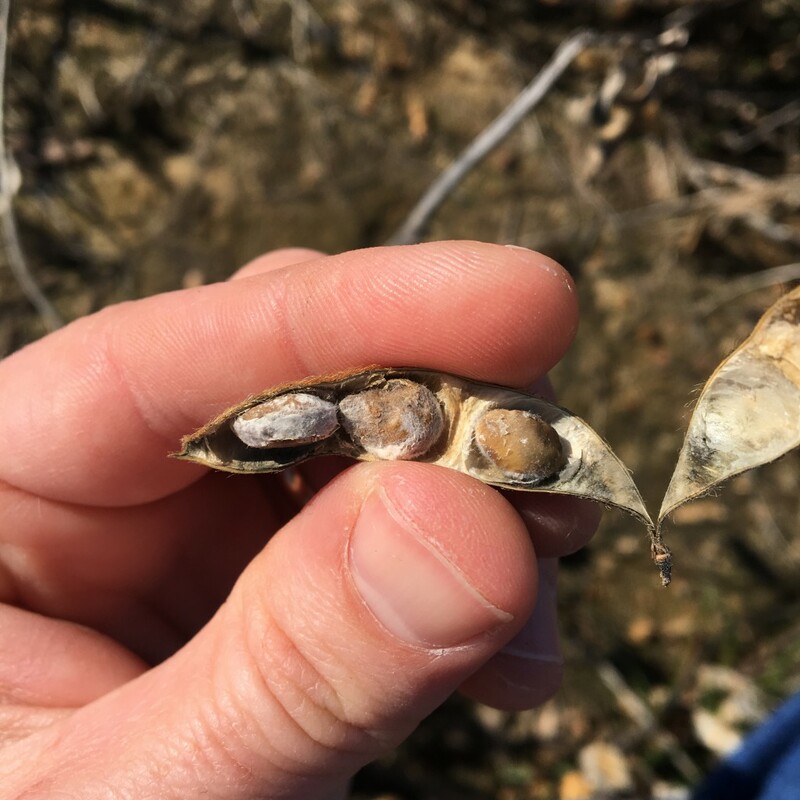 Some of the beans in the pods did not finish filling out as well. Definitely a lot going on in this situation. Phomopsis on beans is typical in these rainy situations. It hasn’t been everywhere in GA, but where there has been hits, it can be as bad as Asian Soybean Rust. This is only because the rain. The rain has kept us from finishing our peanut crop. Some peanuts were on the ground when the rain started and could not be harvested until after. But those peanuts are still okay once they dry out. We have probably 700-800 acres left to harvest in the county. 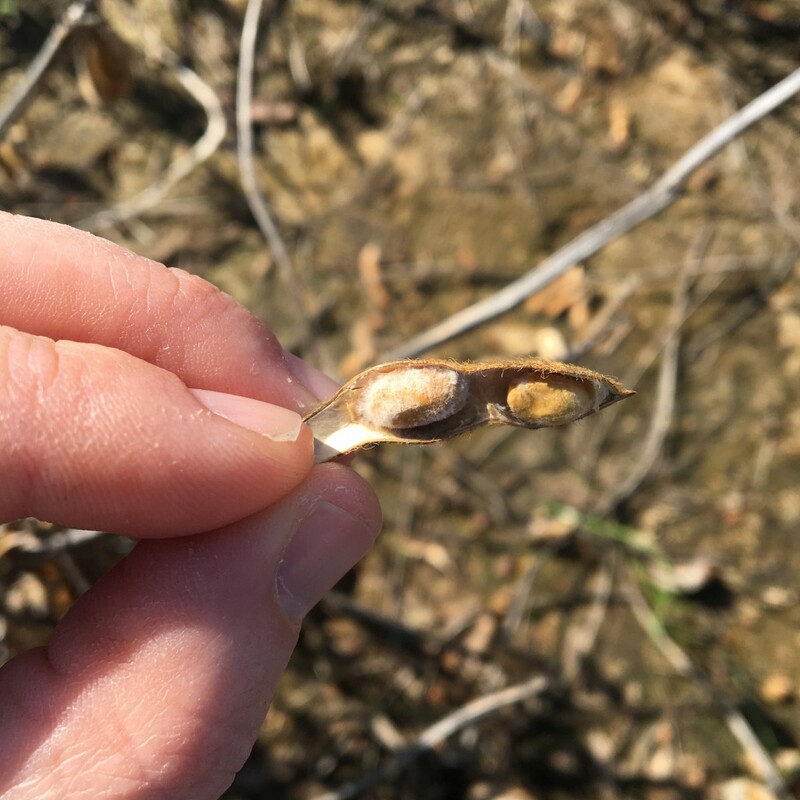 The state is touching 90% on harvest after talking with UGA Peanut Agronomist Dr. Scott Monfort. Cold would be a bigger issue if peanuts were on the ground, but growers watch that carefully. So far no cold damage on our crop. Grades have actually been good with peanuts picked after rain. As I mentioned above, we actually had more rain in 2015 this time of the year and saw color grades affected. The biggest issue for cotton was that we went 2 – 3 weeks of not just rain, but no sunny weather. This is where our color grade can be affected some. I haven’t got a number, but we still have a good bit of cotton to go in the county. This week, growers are really picking a lot. It looks like we still have more rain ahead. The impact of the extensive tree loss we have suffered will certainly be felt in a general drop in production over the next 3-5 years. For growers that lost 30-40% of the trees this will be a large hit if their orchards were not overcrowded. The long-term impact will be felt less in orchards that were overcrowded prior to the storm but it may take a few years for production to get back to where it needs to be. Many overcrowded orchards had young trees inter-planted among older trees. 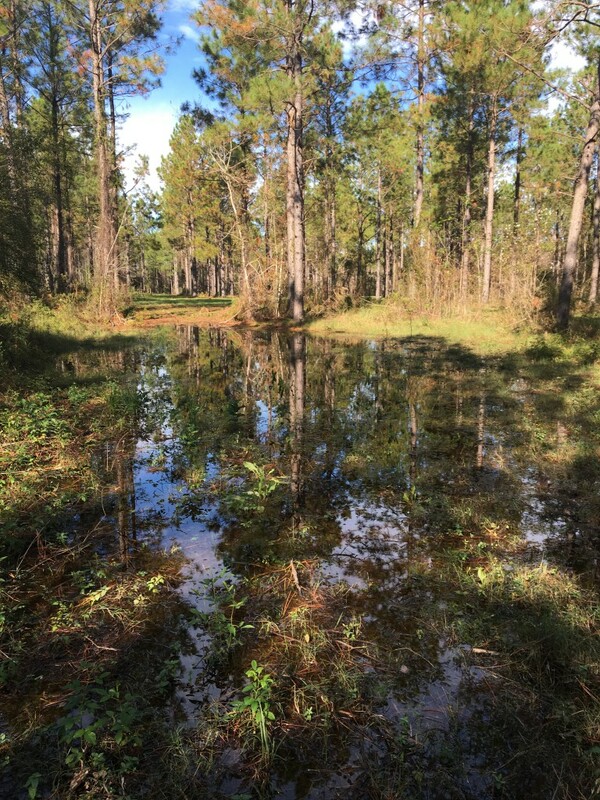 Where large older trees were destroyed, these younger trees and the remaining older trees will now have access to more sunlight, soil water, and air flow. Once these trees recover, they will be more productive and the orchard production should return to normal or may even improve somewhat. Orchards that lost more trees will feel the effects for a much longer period of time. In addition, surviving trees that have been broken up may be likely to develop heart rot and reduced vigor. Trees remaining in orchards along the storm’s path will likely take time to recover. Many of these trees lost much of their fruiting wood in the storm. This will have to re-grow for a year because pecan flowers are generally borne on the new growth that develops from one-year old wood. Since many of the young shoots from the 2018 crop… were lost or damaged in many orchards, the trees will likely have to sit out a year to have very much production at all. Another thing to consider is that trees that were salvaged but were severely broken up will likely produce an over-abundance of water sprouts in the coming year. Such growth usually has a weak attachment point and is easily broken by wind once some weight develops on the ends of these sprouts. In certain situations, selective pruning can help alleviate this problem but often as we do this, the remaining shoots are left more exposed to the wind and will break as well, so it may be better in many cases to let mother nature prune these out until the limbs gain some strength. Most orchards in our affected area carried a heavy crop into the storm, so the trees were already set up to go into an “off-year” in 2019. Our production practices have changed a lot since 1969 and we like to think that with fruit-thinning, hedging, irrigation, spray programs, and fertility, our trees are in much better shape now. Hopefully our drop-off won’t be this severe. But as we can see, the potential is there for our production to be drastically affected. More recent experience with hurricanes in Alabama has shown that trees tend to be off in the year following the storm but come back surprisingly well the year after that. Posted in Peanuts, Soybeans, Weather. Bookmark the permalink.